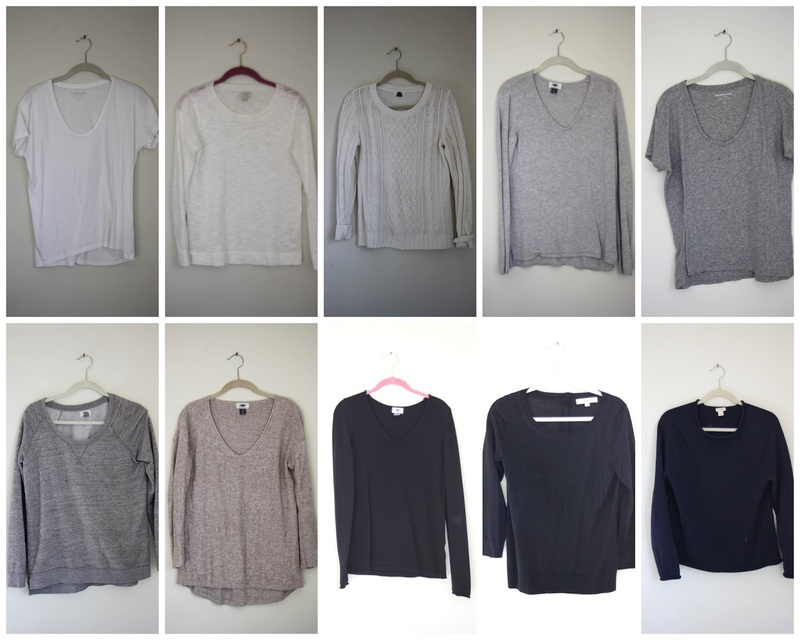 For a long time (about three years), I have wanted to put together a capsule wardrobe. 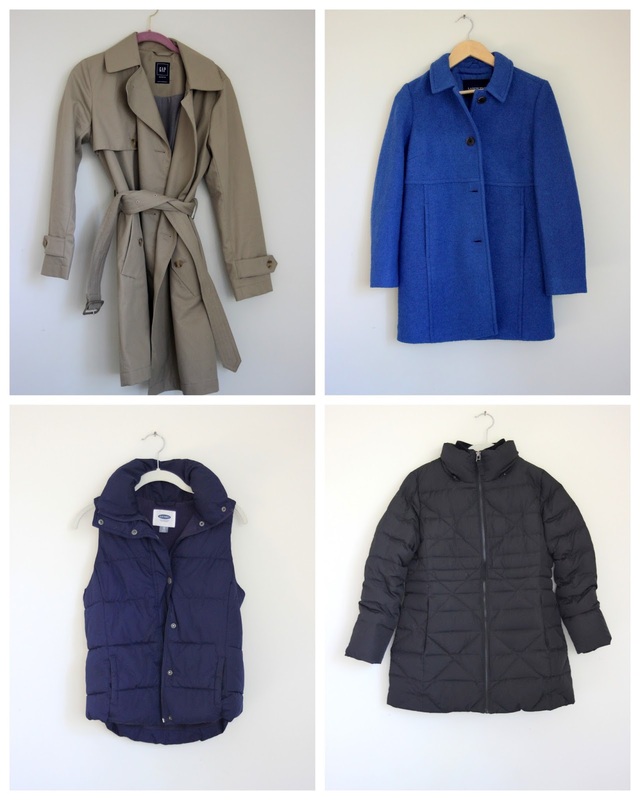 There are so many great blog posts out there about capsule wardrobes.....so if you're interested, pour yourself a cup of tea and dig in! If you don't already know, the idea of a capsule wardrobe is to create a small-ish wardrobe of mix and match pieces that you love and fit your lifestyle! I believe, deep down in my soul, that a capsule wardrobe is the potential solution to the problems I have had with clothes over the past several years. I have had an intense struggle with loving/liking my clothes and finding time to shop. Add to the mix, pregnancy, post-pregnancy, nursing, and getting older, and I have the perfect recipe for a clothing crisis! I know - first world probs. But even more than these things is the issues with fashion industry itself. Styles change so quickly, and I have found that even items at a higher price point are not guaranteed to be well made. You don't always get what you pay for! It has taken me years of "study" to recognize well-made clothes and to learn how to dress in a more timeless style that feels like me. I still feel very much in the process of learning. Anyways, here is my capsule wardrobe. It includes shoes, 2 scarves, and 4 coats. My plan is to wear these 39 pieces for the months of January, February, and March. I will not shop (at all) until middle of March when I put together my spring wardrobe. Spring is my favorite season, so I'm real excited about my next capsule! My plan is modeled after the well known blog, Unfancy. I binged read this blog in the early weeks of nursing Caroline. My capsule does not include workout clothes or pajamas. Also, I think this is a rather large number of clothes, but with a nursing baby it's nice to have lots of back ups. Yes, I have two pair of leopard heels and I wear them both! Would you do this, create a capsule wardrobe? I love having an organized format to follow, and I find so much freedom in having limits! Also, the capsule forces creativity. There are combinations and outfits I would never put together without having limitations. I spy a sense of style! I'm with you on these ideas! And I love the shoes especially. The leopard pumps and the great boots add such flair to everything. I'm in the same boat. Haven't consistently bought clothes in 5+ years so it's overwhelming to start over. I've thought about paying someone to do a wardrobe capsule for me. In your research did you come across any affordable ones? No I did not, but I've read where some people subscribe to stichfix and build a capsule wardrobe over time. That way they don't ever have to shop. thank you for the details!!! wait - you only have 4 bottoms?! I'm impressed. I either don't do laundry as often as you or my kids are dirtier (Phoebe spit up down my jeans today - I didn't change). I'm also very impressed with your small amount of shoes - I have way too many shoes!!! I must put some thought into that (and yes, probably money; shoes are hard for me because my feet are big). 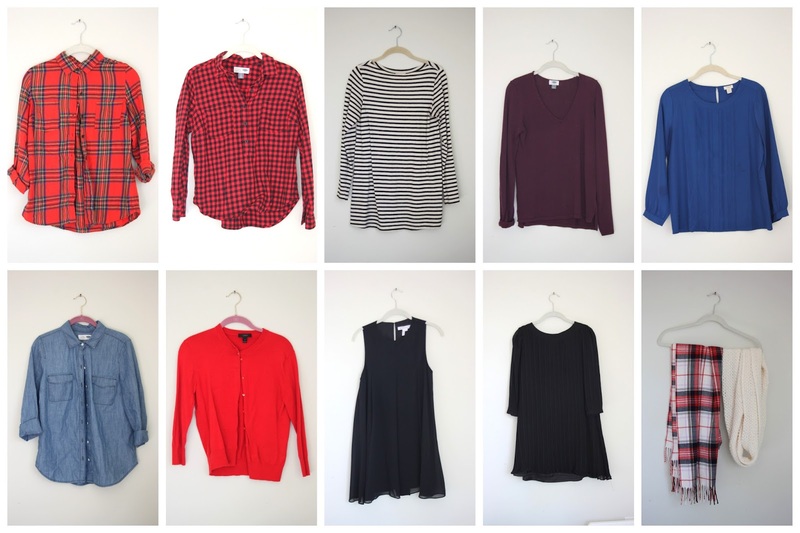 I've sort of had a capsule wardrobe for years. A brown bottom, a black bottom, 2 pairs of jeans. A black cardi, a white cardi, a white oxford. . . some other staples that I replace with no question when they become unwearable. 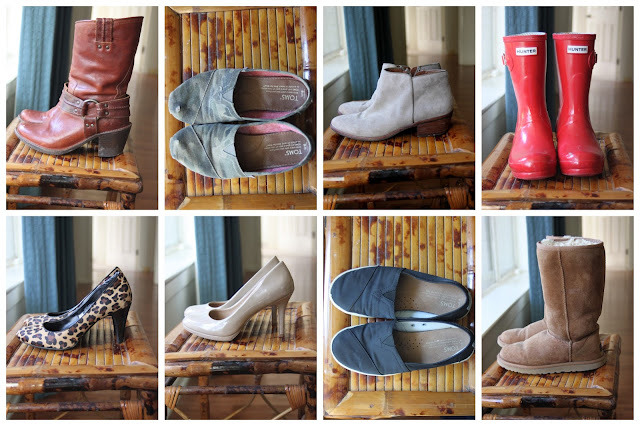 I never buy an item of clothing unless I can think of several other things I will wear it with, including shoes. I think that's what has helped my wardrobe to be coordinated over the years. bottoms - three pairs of jeans, one black pair of pants, and one black skirt. 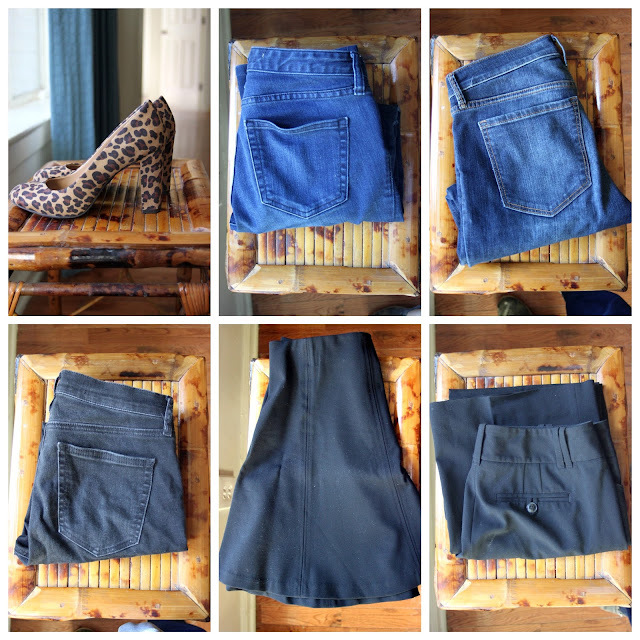 I only wash the jeans as needed and almost never wash the black skirt or pants. I only wear those to church and I change as soon as I get home. Somehow it works. Over the past year I have significantly pruned my wardrobe, so I've created a capsule wardrobe more by default. Out went everything that was ill fitting, stained, rarely worn. Often I've received clothes from family and kept them out of guilt. I've figured out its far better to pass them along through donations so others can enjoy and use them. During this process I've also rediscovered my love of the classic blazer;even the tweed ones! They are perfect for work in the Spring and Fall! I have a navy blazer I bought while pregnant. Can't wait to try it out in the spring! Good stuff. I can't wait to try! I bought a pair of leopard heels last Fall, thinking they'd probably end up at Goodwill eventually, but to my surprise, I wear them all the time! They really are versatile. I wear mine even with, say, a blue sweater. Also, I love how un-trendy your capsule is. Your pieces are timeless and practical. Yes! I'm working on this. Also trying to apply the "spark of joy" test to the clothes I select. One problem I'm running into is trying to decide whether to sort of have a "baseline" of brown or black. I really like brown, but I work in an office and wear black pants all.the.time. I would love any alternative ideas to black pants. I think you could totally do a little brown and black. The rules are there are no rules! Or you could do brown one season, black another.